Your business might often come to a halt with faulty wiring. Even a single fault can bring down the greatestbusiness in minutes and cause substantial losses to the company. Cabling systems are delicate and need to be handled by professionals. Regardless of the size of the issue, VAS technologies can help you design and test the cabling system to optimise your business. Every wire is essential for the smooth functioning of your company. Your company depends on the cabling system from scratch. Be it concerning VoIP phones or higher level networking; your business cannot run efficiently without your data centre connected correctly. Your data centre needs to be designed and connectedefficiently for the company to deliver even at the peak time. Therefore, negligence towards the cabling system can lead to massive losses and damages to the company. Why choose VAS Technologies for your needs related to the design and testing of cabling system? Our professionals are highly experienced and trained in their field of work. They understand the damage of faulty wiring and cabling. We have the latest equipment to test why something is going wrong in your company related to cabling. The material used caters to our professional’s safety as well as the employee’s security. Get in touch with VAS Technologies today! 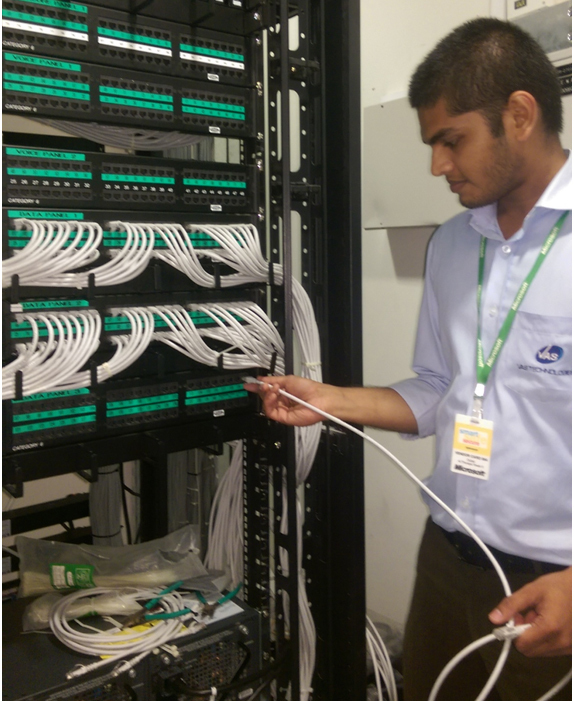 So if you are in need of quality design and testing of your cabling system, get in touch with our professionals today. They will come to your workplace to test and install the cabling correctly to ensure optimal networking.